Royal Dutch Shell, American Tower, and Disney could provide the income you need for a financially secure retirement. Because we're expected to live longer than those just a generation or two removed from us, we'll need income during our retirement for a longer period of time. Finding dividend-paying stocks that provide the opportunity for the long-term collection of such income streams is critical to our financial well-being. Below, three Motley Fool contributors take a closer look at Royal Dutch Shell (NYSE:RDS-A)(NYSE:RDS-B), American Tower (NYSE:AMT), and Walt Disney (NYSE:DIS) -- companies that could be perfect for a retirement portfolio. John Bromels (Royal Dutch Shell): For most income investors, a high yield is the first thing to look for when considering a dividend stock for a retirement portfolio. After all, the higher the yield, the more money the investment will spin off into your retirement account. On that score, big oil bigwig Royal Dutch Shell doesn't disappoint, with a best-in-class yield of 6.3%. But there's more to a top dividend stock than just a yield. That yield needs to be sustainable, and if you're looking for retirement portfolio stocks, you want to be certain the investment will still be around, paying its dividend years or even decades down the line. Luckily, Shell checks those boxes as well. With renewable energy on the rise, Shell is taking steps to ensure it's still a relevant company in a future that may be less dependent on oil. These steps include an aggressive expansion into liquefied natural gas (LNG). Because of its utility as an efficient heating source, the LNG market is projected to grow faster than the oil market over the next decade. Shell recently took a 40% stake in a major new LNG facility being built on the West Coast. When it opens in 2025, it will ship cheap LNG to Asia to meet rising demand. You might argue that LNG is still a fossil fuel (and you'd be right), but Shell is investing in green energy, too, taking, for example, a 44% stake in solar developer Silicon Ranch, and buying electric vehicle charging station provider NewMotion. Shell also owns several wind farms. While these projects make up only a tiny drop of Shell's overall portfolio, it's a reminder that CEO Ben van Beurden and his management team aren't ignoring the shifting energy landscape, and want the company to be well positioned to survive in the decades (and, yes, centuries) to come. For now, though, Shell produces plenty of oil and gas and rewards investors handsomely with a best-in-class dividend. It's a great choice for a retirement portfolio, whether you plan to retire this year or 30 years from now. Anders Bylund (American Tower): This is the closest thing you'll ever see to a sure bet in this crazy stock market. As a provider of cell towers and so-called small cell wireless signal stations, American Tower counts all the major cell networks as important customers. This market isn't going away until wireless networking goes out of style, which I dare say shouldn't happen in our lifetime. Sure, American Tower has its fair share of rivals in the same sector. But this company sports a 17% bottom-line profit margin and a 20% return on equity. The second-largest player in this space, Crown Castle International, nurses a profit margin half as strong as American Tower's and just a 3.5% return on equity. In third place, SBA Communications isn't even profitable. American Tower is also growing its sales quicker than the competition and -- despite its all-American company name -- is exploring exciting growth markets abroad on a much larger scale than the others. Yet, all three stocks trade at roughly 10 to 11 times trailing sales. If I could choose only one wireless tower operator to own, I'd pick American Tower 10 times out of 10. And since the company operates under the tax shelter of a real estate investment trust, or REIT, it must pay out at least 90% of its taxable income in the form of dividends. 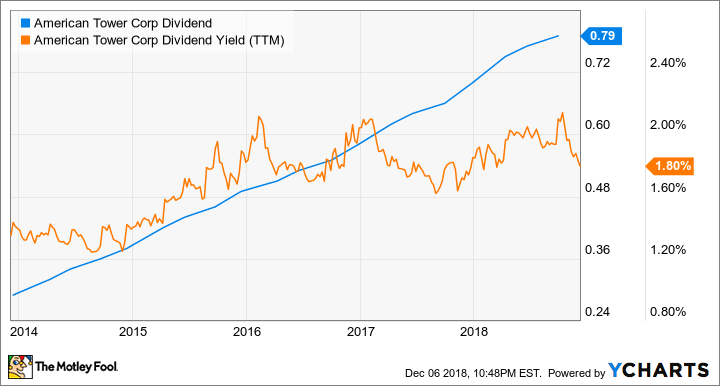 Payouts have increased by more than 170% over the last five years and the dividend yield tends to hover around the 2% mark. Keep in mind that American Tower's share prices more than doubled over that half-decade period and you're looking at a wealth builder for the ages. AMT Dividend data by YCharts. Rich Duprey (Walt Disney Co.): Disney's fiscal year 2018 earnings report last month shows why its stock is one you'd want to buy your kids and why you should consider it for your retirement portfolio, too (and probably every life stage in between). Almost every aspect of its operations was fine-tuned: Its movie studios produced major hits like Black Panther to help propel revenue above $6 billion for the third consecutive year; its theme parks enjoyed double-digit earnings growth as higher prices didn't deter people from showing up; and its media division saw revenue accelerate sequentially, maintaining its position as the biggest, most profitable unit it has. While it did continue to lose subscribers across every media property in the U.S., with ESPN losing 2 million subscribers last year and Disney Channel and Disney Junior losing 3 million apiece, it more than made up for that with 170 million new subscriber adds internationally. Moreover, because the pay TV hit is an industrywide phenomenon, not one endemic to Disney, it is spurring the entertainment giant into new fields. Its ESPN+ streaming service added 1 million new subscribers, offsetting the losses on the pay TV side, and its acquisition of Twentieth-First Century Fox will give it a 60% ownership stake in Hulu. There are new reports that AT&T and Comcast might be interested in selling their combined 40% interest in Hulu to Disney so that once it owns the whole thing it can make a full-frontal assault on Netflix. In short, even where Disney is stumbling, it is being driven to pursue future growth elsewhere, suggesting this is a company that will continue growing for years to come, all the while paying a dividend that puts out 1.45% annually.